Rugby World caught up with ‘Dai’ while he was just settling in to life in the Cotswolds. We spoke about his chocolate lab Frasier, favourite jokes, and life after rugby. 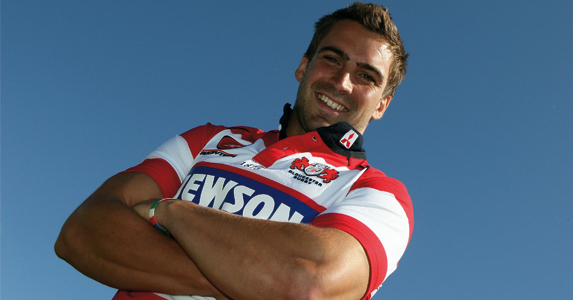 RUGBY WORLD: How have you settled in at Gloucester? NICKY ROBINSON: I moved up quite early in July so I’ve been here a few months now and have settled in really well. There’s a good bunch of boys here. RW: What about going from city to country? NR: It’s a bit different to Cardiff. Cheltenham’s smaller than I thought and the boys are more spread out, but apart from that everything’s pretty similar. I wanted to move to live in a different area, to not know exactly where I was going, and I’ve found things out as I’ve gone along. The whole idea was a change, a new experience. RW: Have you found local accents difficult around Gloucester? NR: A couple of boys, like Andy Hazell, have strong Gloucester accents but it’s been fine. They seem to think I talk with a strong Welsh accent, though. I’ve never thought that, but they think that I sound really Welsh when I say certain words. They think I sound like Daffyd out of Little Britain and have started calling me Dai! Gareth Cooper told me they called anyone Welsh Dai. I’ve tried to change it but don’t think I have much choice. NR: My dog, my coffee machine – I’ve really got into it in the last couple of months and bought a new machine. It’s great. Lastly, my Sky remote. RW: Who are the jokers at Gloucester? NR: Luke Narraway always has something to say – he’s good to have around the training park! Andy Hazell’s quite chirpy too. NR: To turn back time. It would stop me being late all the time and getting fined. It was £10 at Cardiff but £100 here! NR: I’d like to have my own business. I’ve no idea doing what so if anyone’s got any thoughts let me know. If anyone’s got a business that’s already quite successful that they want me to take over that’s even better! I’d basically like to have enough time to play two rounds of golf a week. NR: Andy Powell – it would be entertaining. NR: Lifts! I hate getting in lifts. The one at Kingsholm seems to work okay, but there was the worst lift in the world at Cardiff Arms Park. It could only hold about four people and was on its last legs. It was horrendous. NR: Bad drivers, slow drivers. I also get really agitated when I’m hungry; when I’m hungry I’m horrible. NR: Rachel from Friends. Not Jennifer Aniston but her character, Rachel. NR: My dog. I’ve got a chocolate labrador called Frasier, who’s two. I live near Cheltenham racecourse so there are some good walks around here. He’s enjoying it a bit more than the middle of Cardiff! I take him out twice a day, once before breakfast and again after training. He’s a big old boy so when he’s on the lead he tends to pull me round a bit. He’s good fun and likes lying on your lap so he’s good for warmth. NR: Now, who do I like? Mark Wahlberg’s cool. NR: That’s a bit deep. As a good bloke.